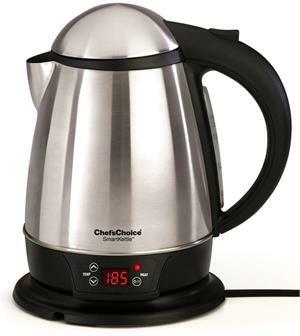 Chef's Choice Cordless SmartKettle - 1.75 qts | Water Heater | Buy Online Now! 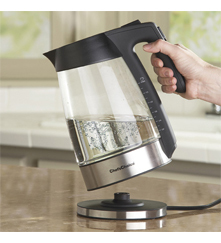 1-3/4 quart kettle that heats water to the precise temperature selected for your tea. This is our Best Selling selection for heating water properly. A cup of tea can be soothing and relaxing, medicinal, or simply refreshing. There are many types of teas and they vary not only in price and taste, but in proper preparation. Some teas taste wonderful steeped in just-boiled water while other teas such as the delicate green and whites, are more temperature sensitive and offer the best aroma and taste when steeped in lower temperature water. Ideal steeping temperatures vary based on the type of tea. How can a tea-lover prepare the ultimate cup? While each type of tea has its own unique characteristics, the optimal taste and aroma is dependent upon the tea being prepared correctly. • Most importantly, water temperature during steeping. The supplier of your tea will likely recommend an optimum temperature or consider heating enough water so you can preheat your cup with it before you steep your tea. You may wish to heat the water to a temperature slightly above that recommended to compensate for the cooling effect of the cup. The Chef’sChoice SmartKettle® can help you achieve your perfect and desired temperature. 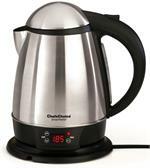 It’s the only kettle that heats water to the precise temperature selected. Using less than half the energy compared to a stovetop kettle on an electric stove, it’s the world’s most advanced electric kettle and a must have kitchen appliance for serving up temperature sensitive teas including herbal, white, green, black, oolong, and rooibos. 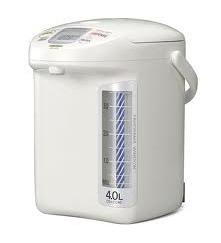 In just minutes, it will heat water faster than a microwave or stove top to make not only tea, but instant coffee, hot chocolate, hot cereals, instant soup, jello, pasta and blanch vegetables at the ideal water temperature. 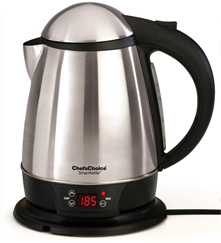 Serve up your perfect cup of tea today and everyday with the Chef’sChoice SmartKettle®!